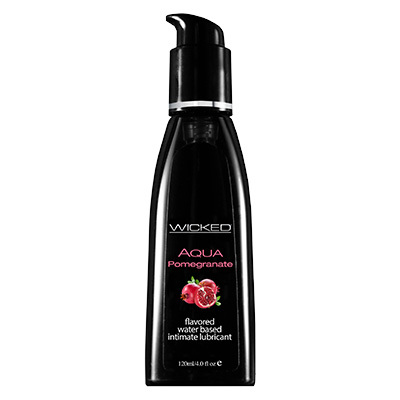 The Wicked Pomegranate Flavoured lubricant is smooth, sweet and highly desirable, but without the seeds. A fruity taste within the lubricant gives natural invigoration. Not too sweet and not too sower, but just right. The Wicked range of flavoured lubricants are all water based, made with natural flavouring and all highly delicious! The Wicked Pomegranate Flavoured lubricant is smooth, sweet and highly desirable, but without the seeds. A fruity taste within the lubricant gives natural invigoration. Not too sweet and not too sower, but just right. The Wicked range of flavoured lubricants are all water based, made with natural flavouring and all highly delicious! Enjoy the natural feeling that water based lubricants can provide when they are of this quality, but with the added kick of being both a physical sensation and a taste sensation. All the flavours in this range are long lasting, latex (condom) friendly, Paraben Free and are not tested on animals nor contain any animal by products. The natural flavouring will not leave any nasty after taste. Candy Apple – take a bite into a sweet, sensual fruit tasting lubricant. Mocca Java – a sophisticated taste that is intended to keep you up all night! Cherry Cordial – sweet & taste, just the way you like it. Cinnamon Bun – perfectly delectable. Great lubricant, even better taste.